My eyes are always seeking beauty. It appears to me in moments and things of everyday life. I believe that the ability to be aware of beautiful moments captures a deep source of joy in life. Quite often I sense a poetic story beneath the appearance of these things. As a designer I aim and wish to capture these poetic moments to create images and objects which can bring beauty and joy into other people’s lives. 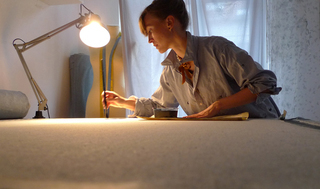 I am a textile designer with a focus on special materials that reveal an enjoyable background story and which are produced in a sustainable and friendly way. By working with these distinct materials I like to contribute to an optimistic approach towards textile and fashion production.